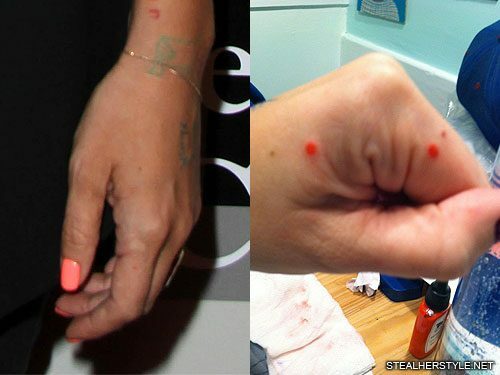 Sia has two red dots on each of her hands so that she can make a face with her thumb. 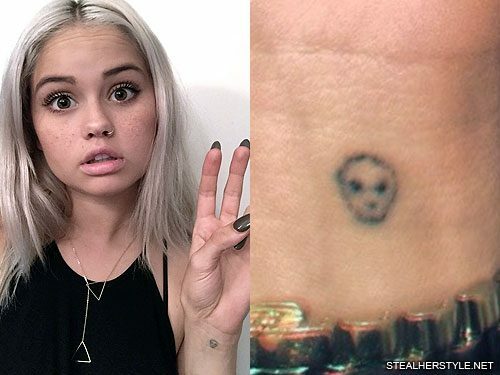 She got this homemade tattoo on New Years Eve in December 2011. Artist Stanislava Pinchuk works in a very non-traditional way. She only accepts payment in the form of trades — Lily gave her photographs and a book. 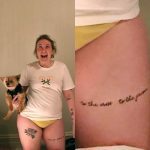 Her home-made tattoos are created specifically for each client.“Every one is different, just a lot of consideration & talking” she wrote. 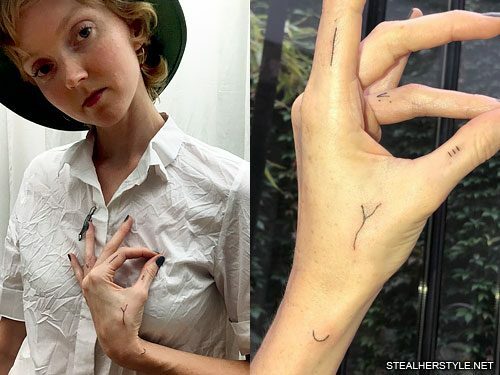 The five tattoos that she created for Lily Cole are scattered throughout her fingers, hand and wrist. The letters of the name “WYLDE” aren’t in any readable order. 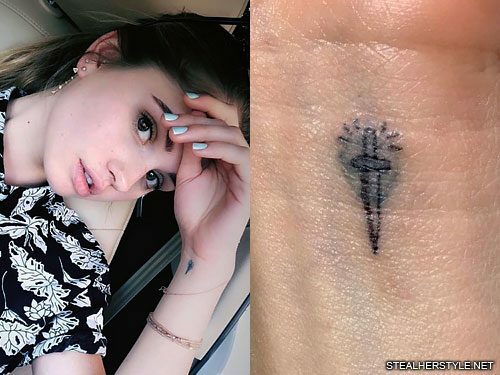 It’s the sort of tattoo that’s meant more for artistic expression and internal reflection rather than to convey a message to anyone else. 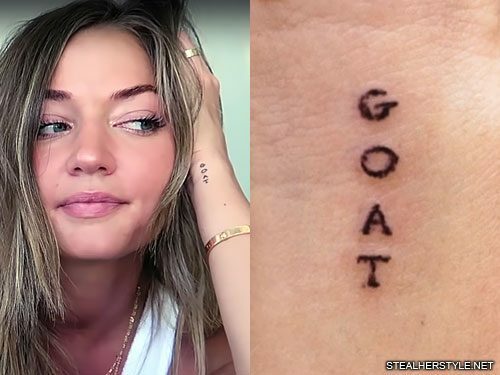 Erika Costell and her boyfriend/husband Jake Paul got matching “GOAT” tattoos in January 2018. The YouTube power couple known as “Jerika” both got the word written in capital letters that are stacked vertically. 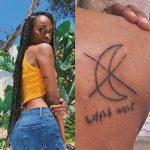 She placed her tiny inking on her left forearm while he incorporated his much larger “GOAT” tattoo into a growing collection of intersecting words on his left thigh. They joked that Erika is a goat, as in the animal, while Jake is the GOAT, an acronym for Greatest Of All Time. Why am I obsessed with goats? When I was 12 years old or so I had a pet goat. I loved this goat so much. His name was Twinklebuddy. I also had a couple other weird animals with weird names, but Twinklebuddy was my favorite and he actually died unexpectedly. I’ve been obsessed with goats my entire life. I don’t know where it came from — well I know it came from Twinklebuddy but it’s stayed with me all the way til right now. So that’s the reasoning behind everything goat. It also means Greatest Of All Time. V I S I T O R S — Nothing is ours and everyone is visiting. Some people stay a while. Some are just passing through your life. Some stay as long as they’ll stay anywhere. It’s important for us to be super careful of the souvenirs they leave with and that they leave in us. 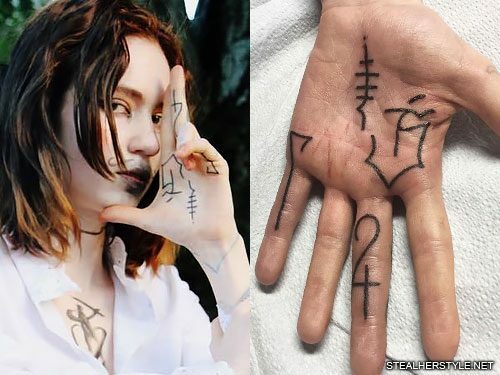 My buddy and I tattooed this V on my right ring finger and his left thumb-knuckle so that every handshake reminds me I’m visiting and greeting a visitor.